The whereabouts of Captain Rowley's Medals are unknown, but he was entitled to the above three medals. Joshua Rowley was born in London, the second son of Sir Joshua T. Rowley, 5th Bart., of Tendring Hall, Stoke by Nayland and Holdbacks, Hadleigh, Suffolk and Hon. Lady Rowley. As a young man he spent some time in France and Germany and worked for two years at Barclays Bank in Ipswich and London. 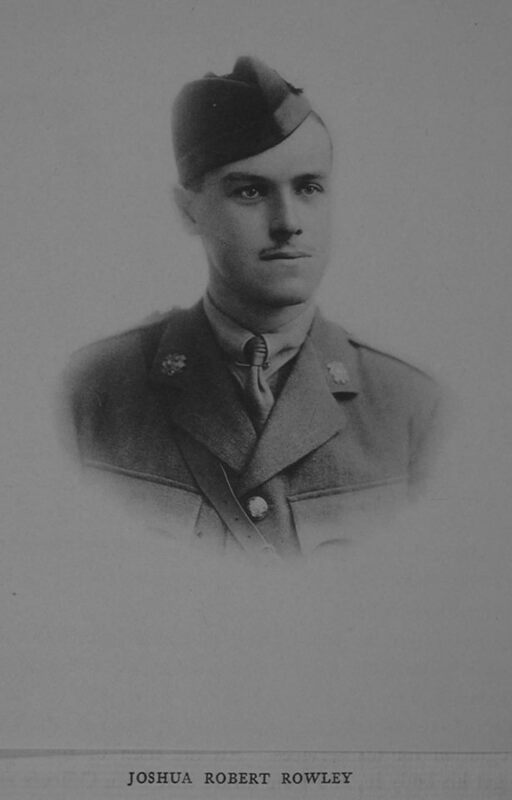 His father was the Honorary Colonel of the 1/5th Battalion The Suffolk Regiment Territorial Force and so in 1912 Joshua joined the Battalion as a Second Lieutenant and became a company commander. In 1914, he received a Commission into the Highland Light Infantry, however, he continued to serve with the Suffolks. At the outbreak of war, the Battalion was mobilised on the night of the 4th/5th August 1914. Once mobilised the 1st/5th Suffolks spent a number of months carrying out home service tasks. At that time territorial units were only liable for home service only and were not required to deploy overseas. However, when it became apparent that more troops would be needed for overseas service, the men of the battalion were asked to volunteer. After giving this some serious thought, 72% of the men volunteered and the battalion was redesigned 1st/5th Suffolk Regiment. Those who opted to stay on home service duties only, became the 2nd/5th Suffolks. On that day at least 75 Hadleigh men went into battle, including Capt Rowley. It was a true baptism of fire. They were told it would be a straight forward advance to mop up the odd sniper, but in reality they faced a determined and ruthless enemy. The enemies intimate knowledge of the ground was key. They sniped the Suffolks who could not see the firing points and even if they could, they had no artillery support to combat the snipers. In addition, the Turks made best use of their own artillery which ultimately halted the Brigades advance. The Suffolks fell back to a shallow river bed / ditch where they formed the new front line. A few days later they were relieved and returned to the reserve trenches where they discovered that the attack had cost them dearly; 11 Officers and 178 Other Ranks were killed, wounded or missing and 15 of the dead were from Hadleigh. By late September the what was left of the Suffolks were manning 'Norfolk Trench', a front line trench on Hill 60. Hill 60 was a key feature that overlooked ANZAC Cove and so was the scene of some hard fighting. On 24 September there was only 4 of the original 23 officers still in the line and Capt Rowley was one of them. Capt Rowley and the Battalion left Gallipoli in December 1915 for Egypt. The storey will continue soon. We hope that this page has been able to tell the story of Captain Joshua Robert Rowley. If you know of any information which might help to add to the story then please get in touch.